Last month, I had to do some farewell baking for a colleague and I was told by inside sources that it was preferable the dessert be non-chocolate. As you all know this tends to be a challenge for me but instead of scouring Tastespotting I thought perhaps I would actually just create something on my own. I had been thinking of salted caramel a lot (you know, as one does) at the time and thought it would be great to have a salted caramel themed dessert without chocolate. I absolutely love the recipe I found on Smitten Kitchen for salted caramel a while back (link below in ingredients list) and decided to make that and then incorporate it into a blondie where I had browned the butter for extra flavour. For those of you who aren’t familiar with blondies, it’s basically just like chocolate chip cookie dough without the chocolate chips. You can’t really go wrong. The recipe for the dough is super easy and just has the extra step of browning the butter. The caramel is a bit of an extra time investment but really not much – and feel free to be liberal with adding the sea salt into that to properly get the sweet and salty contrast in these. They disappeared incredibly fast at work and the people in my office are super fit and don’t really like baked goods as much as my American colleagues, so I think that’s testament to how good they are! Then go here for the salted caramel ingredients and instructions on how to make it. Pretty easy really. Preheat the oven to 350 F /180 C. Take a large rectangular pan (9×13 for those of you who speak in inches) and line with parchment paper or spray well with non-stick spray (or you can butter it). 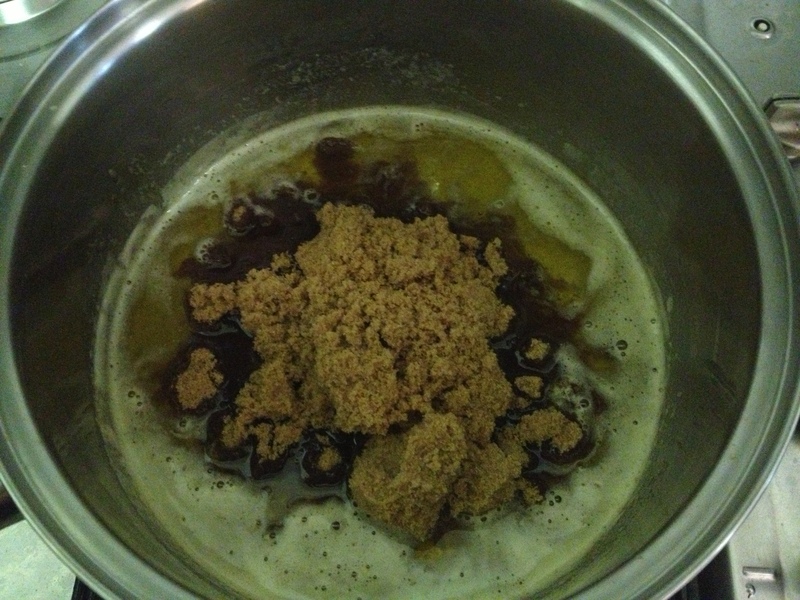 First, make your caramel so you can put it in the freezer and it will be ready by the time you put the dough in the pan. Once the caramel is in the freezer hardening up a bit, melt and brown the butter in a large saucepan over medium high heat which typically takes about 5 minutes. Remove from heat and let cool. The butter will continue browning once it is off the heat. Always watch the pan carefully when you are browning butter – it will foam up a lot right before it’s ready. Stir frequently and smell for the nutty aroma – as soon as you catch a whiff, take it off the heat. Let the butter cool in the fridge for about 5 minutes. I then add the rest of the ingredients right into the pot to save clean-up later. 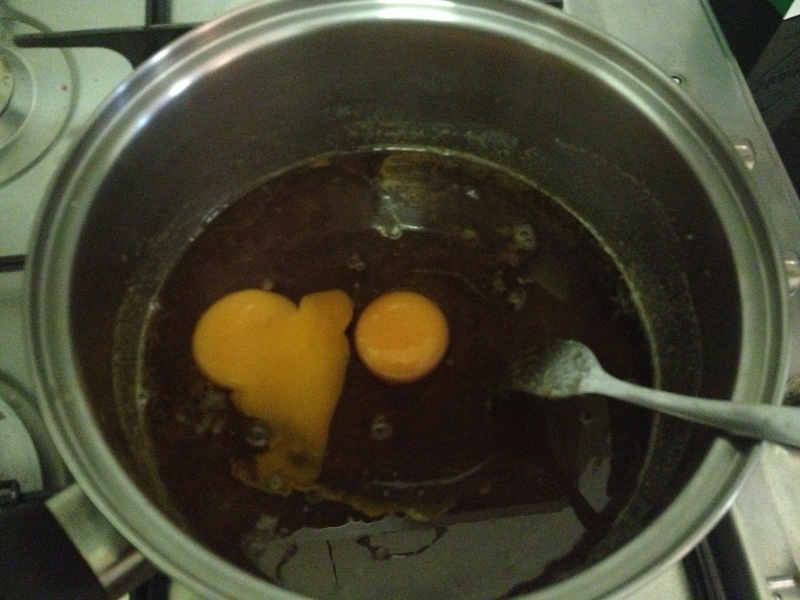 Add in both sugars and mix thoroughly, and then beat in the eggs and vanilla extract. Toss in the baking soda and salt and then slowly add in the flour until just combined. Add in any additions if you are using them. Spread the dough into the prepared baking pan. 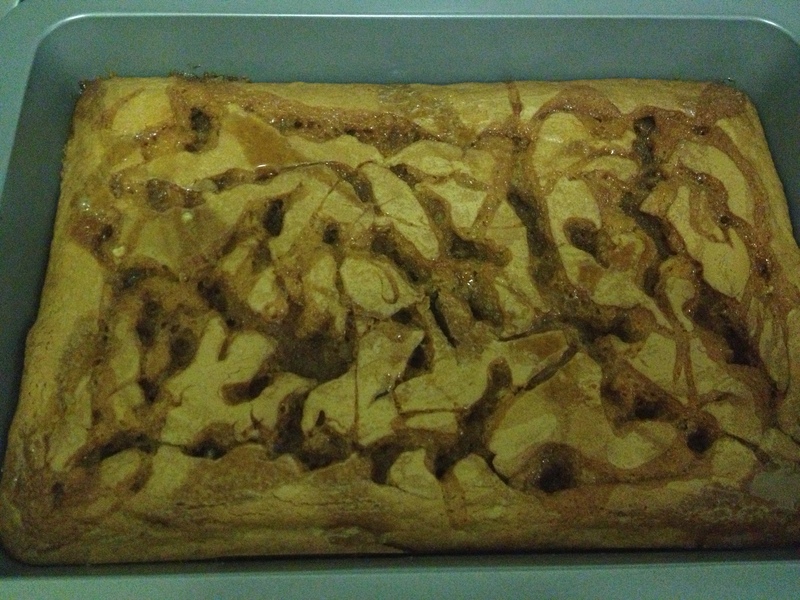 My original idea was for the caramel to be hard enough so that it would be little bits and I could mix them into the batter, but the caramel was actually still fairly gooey, so I decided a better idea would be to swirl it all over the top of the blondies once they were in the pan. So depending on the consistency of your caramel you can do either. I just dropped bits of caramel all over the top of the dough and then used a fork to swirl it throughout the batter. Bake for about 30 minutes until the blondies are golden brown, but make sure to check them sooner. Cool completely before cutting into squares. Finished product. As you can see it sunk in and made some awkward holes in places but believe me it has zero effect on the taste. I absolutely loved how it permeated through everything. 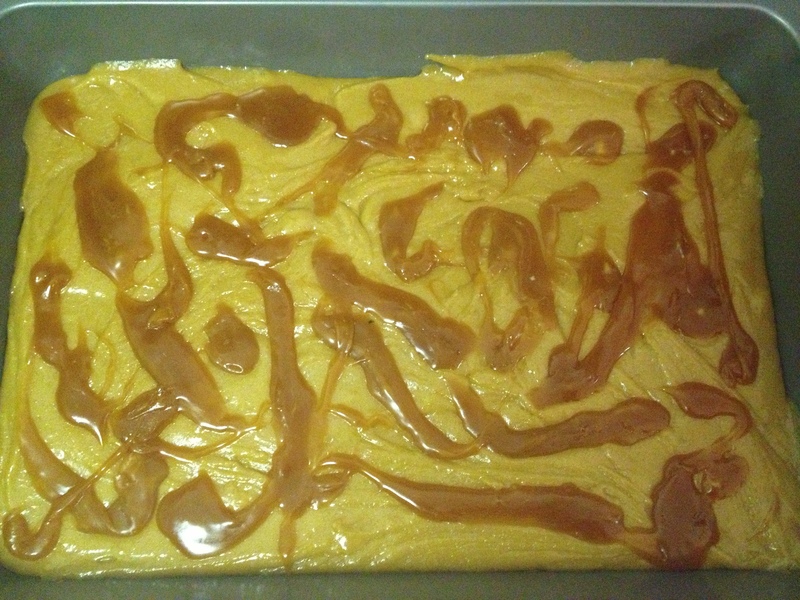 I actually saved some of the caramel to drop on the finished bars right when they came out of the oven. Feel free to get creative with how you use it! I must admit this is one of my finer ideas. Everyone loves salted caramel and it was a breeze to take a recipe for that and just add it to a blondie batter instead of a brownie one. These bars nail the sweet with a hint of salty combination and the recipe makes a lot so it’s great to bring to a party or to multiple occasions. This is definitely one of my favourite non-chocolate desserts I’ve made in the past few months!